Rutam [ऋतं] means what has to be done in keeping with the sastra and which has been very well ascertained in the intellect. I declare you to be that rutam because it is in your domain. That Rutam when it is expressed through speech and body is called Satyam [सत्यं]. That also is accomplished with Your grace and so I declare you to be that Satyam. Any human end is purushartha. What is desired by people is purushartha. What you want to accomplish in life is purushartha. We have two words rutam and satyam. One has checked one's understanding to see if it is in keeping with sastra, in keeping with what is right and wrong. That is rutam. In one's buddhi it is very well ascertained as to how a thing has to be done. That kind of clarity is rutam. And that is what Bhagavan is. The student addresses Bhagavan: I declare you to be in the form of rutam. Once I have done this, afterwards when I express it, it is called satyam. If what you think is not well-ascertained and you speak what you think, it is not satya-vadanam. O Bhagavan! You are Satyam in the form of Vayu, Sutratma in everyone. Satyam is the same Bhagavan who is Rutam, who is now accomplished, manifest in the form of words and physical deeds.What is spoken is followed by action, and that is also Satyam. Without Your grace I cannot maintain Satyam, it is within your domain. And without Your grace I cannot understand Rutam. For both I require Your grace.This support system is Bhagavan. 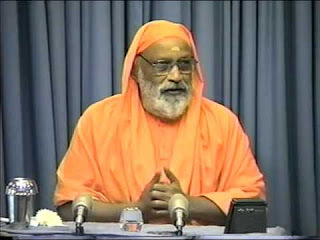 Even to understand dharma, follow dharma and live up to that dharma, I require the support of Bhagavan's grace. Prayers become the support system. Bhagavan is the only permanet factor in the support system. Let that Brahman protect me, the seeker of knowledge, by blessing me with knowledge. Let the same Brahman protect the teacherby blessing him with the capacity to teach. The repetition of the words avatu mam, avatu vaktaram is for emphasis.